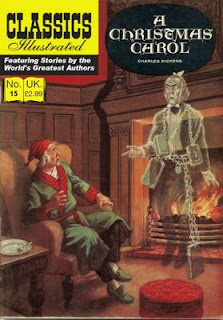 In W.H.Smith today, I spotted and bought the latest reissue in the British Classics Illustrated series. Dickens’ A Christmas Carol as written by George D. Lipscomb and drawn by Henry Kiefer. I’m a big fan of Dickens and this book particularly. There have been many re-tellings of the story in comics. It’s funny that with the nice super-white glossy paper the work loses something for me. I think it would look better on browning old newsprint. Still, it’s well worth picking this up. Classic Comic Store are doing a good job packaging up these old comics at good prices. It would cost a small fortune to pick up the original 1940s edition today.